I just wanted to inform you that i just released V0.50a (Beta 4) of my PowerPreview script on ScriptSpot. It has come a long way since i posted the “proof of concept” version here in a thread somewhere. Great! And many thanks for making the freely available. I still need to swtich to Nitrous for my daily work and the dynamic reflections are very cool. How do you enable them? Is this a hidden per-object switch or do you need to enable them somewhere in a material and if yes, do they work with 3rd party materials or mray materials only? The preview image you posted on scriptspot (the one of the car) looks awesome! Oh dang… this looks like a must have. Awesome!! I was just wishing for this hte other day. I’m excited to check it out! “Environment Background” has to be checked in the viewport background options and “Show Background” is enabled. Or “Use Environment Background Color” is enabled in the Viewport Configuration settings. Via Maxscript you have access to an additional “.DynamicReflectionEnabled” options in the Viewportsettings interface. Using that you can have dynamic reflections between objects. It’s a bit buggy, and tends to fail from time to time ( at least on my graphics hardware - which is quite old) , but it works. But knowing the reality of coding and the technical boundaries i have to cope with, i think without having access to a lower level of the Nitrous/OGS API this would be a near impossible task. As far as I understand it, the Direct3D DOF and MBlur don’t use any G-buffer data anyway. 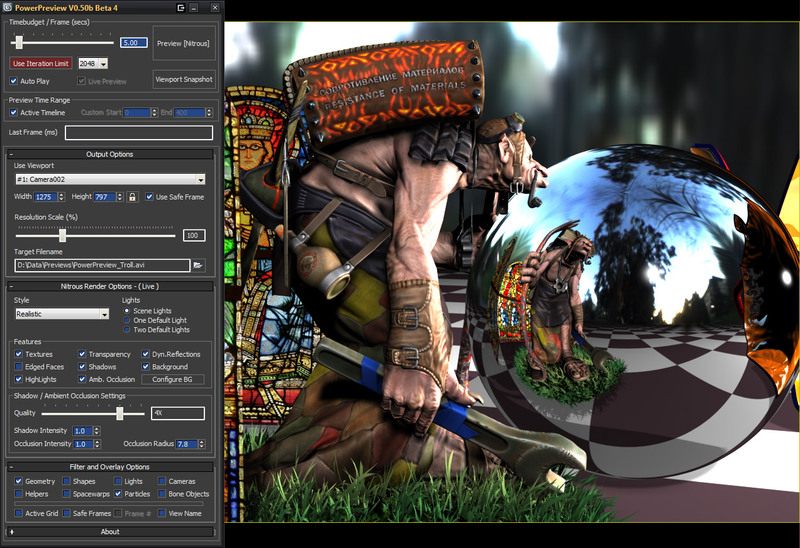 DOF works by offsetting the camera in a circular manner (depending on the number of samples you choose), while staying “targeted” on the desired focus depth. These different perspectives are then blended together to create the blurred image. MoBlur appears to be even simpler, in that it just records the subframes before and after the current frame (again, depending on the settings) and blends those together. It seems to be more of a brute force method, without using any fancy G-buffer trickery. I don’t know though to what extend Nitrous access allows storing images internally, blending those with each other and outputting the result. yeah - you are correct, they are pretty brute force, but that only works because the rendertime per frame in D3D is in the milliseconds range. As the concept of PowerPreview is to give Nitrous time to do it’s progressive refinement ( leading to many seconds of rendertime per frame ), this method would not be very viable for Nitrous. Additionally it would destroy the great quality Nitrous is able to produce. I am seriously loving the dynamic reflections, that is such a nice hidden bonus in this tool. PowerPreview really needs to be integrated into the Viewport capture menu and ship with max. I don’t see why not, it’s silly for them to push Nitrous and then completely lack an ability to capture it to stills or video. The functionality is sorely missing, and I don’t really like the “oh, just use Quicksilver” logic, since there are sometimes differences between Nitrous and Quicksilver. I am getting a bug though when using PP, in that it seems to capture the first frame of my video well, but subsequent frames are low quality, even though they still take the same amount of time. I am saving each frame to a .png file, could this be the cause of my issue? By bad quality you mean no refinement going on, everything looks like it was without progressive refinement ? Meaning you don’t notice any smoothing in the frame over time ? Realy thank for this script, is realy perfect, but i have problem to do 2k (2048x1556) previews, the first frame looks good bud every next is it has 2k resolusion but image is stretched it looks it is zoomed from maybe 640x480 resolution. Thanks again for this tool, and right now I’m using it intensively for creating all the preview stuff for my current project. I sincerely hope you can find away to allow switching to another window while rendering the preview, while Nitrous refinement still keeps going! Viewport previews are alreaady saving a lot of time as they are, but it would be even better if I could work in another window/program while rendering. Tiny one: Viewport snapshot isn’t snapshooting (is that a word?) the current frame, but the start frame set in the preview time range… grabbing the current frame would be more sensible, I guess. And some feature requests at the end: Output of Alpha-channel (or at least a “silhouette” render style), Z-channel, Object Masks, Ambient Occlusion, Shadows and whatever Nitrous supports.